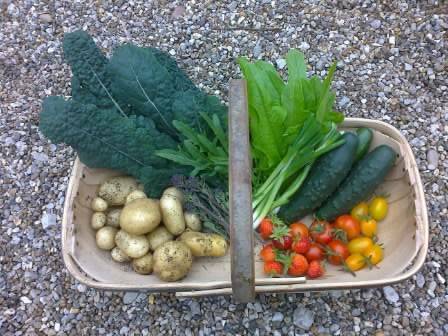 At last the harvest has begun in earnest in the Kitchen Garden. It feels like it's been a long time coming as we are obviously delayed this year due to the weather. This month we have been harvesting kale, sprouting broccoli, cucumbers, tomatoes, strawberries, salad leaves, spring onions, rocket, rhubarb and new potatoes. Picking lots of delicious organic produce is so satisfying and the very best part of kitchen gardening. 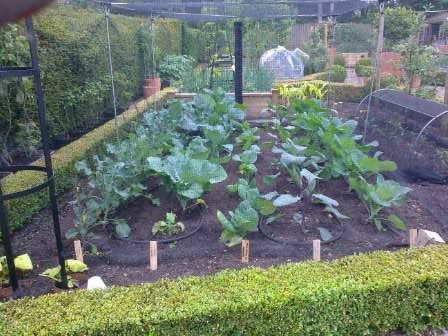 Our brassica cage is looking particularly lovely at the moment, with it's regimental rows of lush vegetables growing happily away. We are harvesting broccoli now, and the calabrese is now beginning to form heads. Jo has given these plants a feed of blood, fish and bone to keep them growing well. They are given a good watering once a week if it hasn't rained and kept weed free with regular hoeing. So far, no pests but we are keeping vigilant. Also this month we have given our courgettes and squashes a seaweed feed and applied a granular tomato feed to our peas and beans. Pests have been appearing in other parts of the kitchen garden this month. Our espalier apple trees have been setting lots of fruit and putting on lots of lush growth. However, in mid June we noticed some leaf curl starting to appear. Uncurling the leaves revealed aphids feeding on the foliage. Jo was straight out with the organic Insect Killing Spray and then took a delivery of ladybirds to introduce to the trees as we have noticed that ladybirds seem to be scarce so far this year. Within a few days the trees are already looking better and recovering from the attack. Our peas and beans have been under attack from mice, but a mini fence of chicken wire has put paid to their midnight feasts. Also this week we have given our soil another dose of Nemaslug to stop the slugs from destroying our hard work. The plants in the greenhouse are starting to reach for the skies. Jo has built a Slot and Lock frame for the tomatoes to keep them supported and looking tidy. Yellow sticky traps have been hung amongst them to trap any insects with an eye on our crop. We've potted our greenhouse plants in groovy pots this year and they make an amazing colourful display. 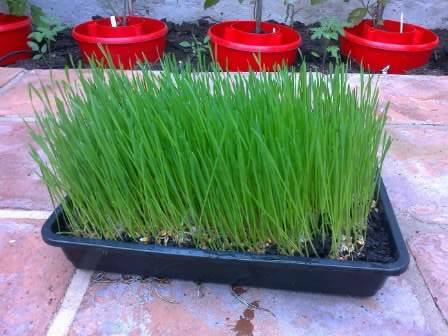 Our new crop this month is wheatgrass. This is a really fast growing crop, taking ten days from sowing to harvest. The wheatgrass is then cut and juiced providing a superfood drink which has some amazing health benefits. It is so easy to grow. Even though every last inch of soil in the kitchen garden is covered with crops, we are preparing for the gaps that harvesting will leave. We've been sowing more calabrese. squash, cucumbers, peas, beans, beetroot and carrots and potting up swede and fennel. Our thoughts are already turning to the autumn and we're working out our order for overwintering onions, shallots, garlic along with new potatoes to plant up for a Christmas harvest. Depsite the cooler temperatures this year, we have a corner of the kitchen garden which is always balmy - our Hotbin composter. The thermometer seems to be permanently set at 80 degrees. It is producing beautiful crumbly compost crawling with worms. It will be incorporated into our raised beds as they free up for new crops to keep the soil fertile. Continue sowing salad crops to keep harvesting throughout the season. 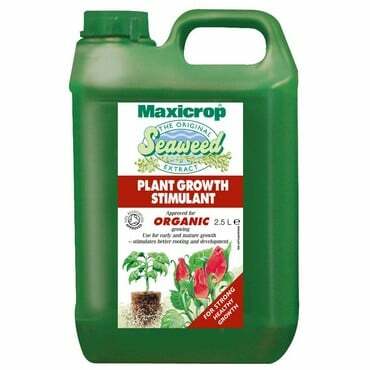 Keep feeding tomatoes, peppers and aubergines weekly. Cover the ground between crops with Strulch to help keep the moisture in and the weeds at bay. Shade the greenhouse on summy days to prevent scorching plants. Keep an eye on pests and diseases to prevent them taking hold. Thin out the fruits on apple and pear trees after the June drop.